Recreational diver training agencies have always encouraged divers to adopt the buddy system and always dive in buddy pairs. Diving in a group made up of more than two people has been described as undesirable, while most agencies explicitly ban solo diving. This view must be balanced against the teachings of the technical diver training agencies who encourage divers to dive as a team and often cite three as the optimum team size. Technical divers carry out a large number of challenging dives to depths well in excess of the recreational limit in this team format with obvious success. What makes them choose this style of diving if the recreational industry is so set against it? There are a number of reasons for the apparent contradiction between recreational and technical training agencies. By examining these reasons we may be able to adopt some of the best practices from team diving for use in recreational diving. We will also see that many of the concepts of good buddy diving are the same as those of good team diving. Team diving has a number of disadvantages if you are not familiar with diving in this way. Most recreational divers have little experience of this type of diving and usually express a dislike of diving in a three. This is not surprising as all recreational training focuses on diving in buddy pairs, and for most divers, their subsequent diving has all been focused on buddy pairs. So, it’s no wonder that diving in a trio is uncomfortable, as you have never been trained to or practiced diving in this way. In the recreational world, a trio is often put together at the last minute due to odd numbers. Very little thought is put into who should be teamed up with whom, and there is no preparation, planning or practice. In this case, we end up with a haphazard trio, which is certainly going to cause more problems then a traditional buddy pair. If an incident occurs, then the third person adds confusion to the situation rather than helping to resolve it, and there have been a number of cases where two divers become involved in a situation and subsequently become separated from the third. In these cases, the divers are not following a team diving approach but are simple jumping in as a trio. The buddy system also has its disadvantages. It can lead to buddy dependence where we always assume our buddy is there to get us out of trouble. This is not always the case. In the case of a problem, underwater buddies are often too far apart to be able to help each other or do not pay sufficient attention to their buddy to notice that they have got tangled up in fishing line or have experienced some other problem. The buddy system is often followed in name only with so called “same ocean buddies” who jump in together and will spend time somewhere in the vicinity of each other without really expecting to stay together. These divers are effectively solo diving but without the equipment, training and experience to deal with a problem on their own. Poor buddy skills often go unnoticed on recreational dives, but for technical dives or on dives with three divers, these buddy or team skills become much more important. 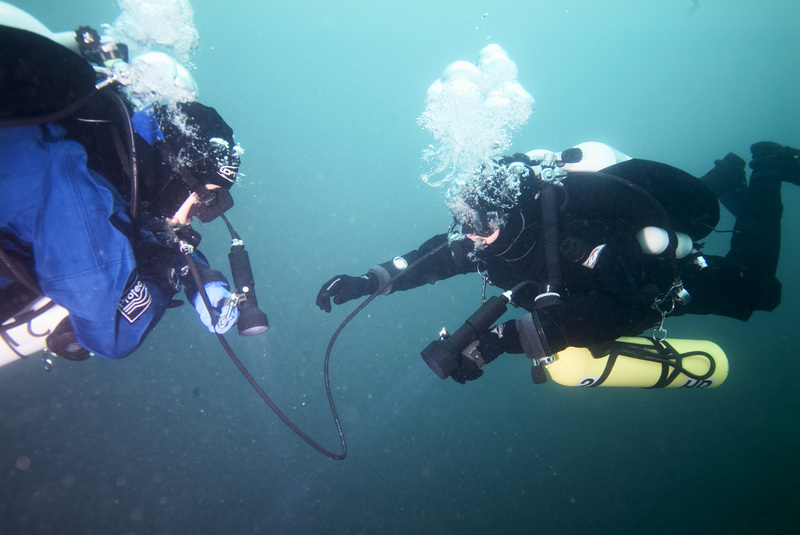 It is possible to get away with poor buddy skills when there are only two divers, but this becomes less feasible as the number of divers increases or the complexity of the dive increases. In this case, additional techniques and training are required to ensure things go to plan. Effective team diving clearly involves more than just diving with more than two divers. Team diving involves a style of diving where diving in a trio or larger group is a conscious decision, which is planned in advance and where adequate training, practice and preparation has already been carried out. Don Silcock takes us to the mystical haven of Halmahera in the Maluku Islands.